Accessories: Accompanied by Universal Genève Extract from the Archives confirming production of the present watch in 1945. The generous 38mm diameter of this timepiece fully classifies it as one part of that rarefied category of vintage timepieces which stylistically resonates with contemporary taste. That is even more true when one considers the stainless steel case, luminous dial and exceptionally balanced dial layout. 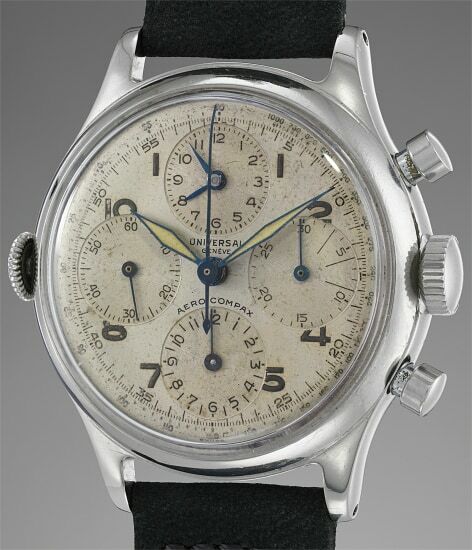 The present watch is an example of tool watches from the mid 20th century, a categorization which explains its large-for-the-time dimensions and the presence of the luminous dial, and is as aesthetically appealing as it is collectible. The additional dial at 12 0’ clock can be operated via the crown at 9 and displays a fixed time, intended to serve as a reminder to the wearer of the time of important occurrences (such as a take-off time).